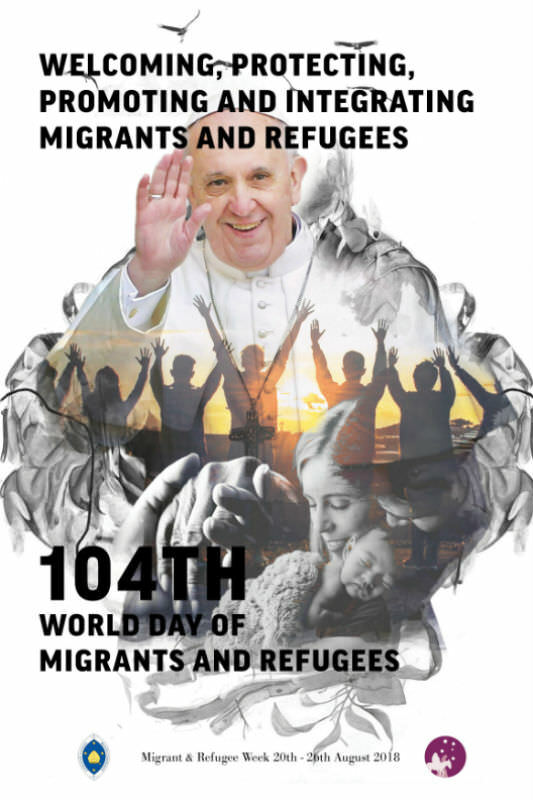 During Migrant and Refugee Week 2018, Catholics are being asked to reflect on Pope Francis' 2017 call for a shared response to 'welcome, protect, promote, and integrate migrants, displaced people, refugees, and victims of human trafficking'. As part of such a reflection it is important to consider how our society is heeding this call and putting it into action, and where we can do better. There are key things to be positive about. The Australian government has increased the number of visas granted to UNHCR-recognised refugees from 16,250 to 18,750 in 2018–2019. Multiple state and territory governments have provided study and travel concessions to people seeking asylum who would otherwise not be able to afford and therefore avail of these basic rights. More than 140 local government areas and councils around the country have declared themselves Refugee Welcome Zones. Thankfully, there has been vocal bipartisan opposition to Fraser Anning's performance in parliament last week, although such a response is something we should expect and not have to congratulate. Nonetheless, on the whole, our leaders' approach to migrants and refugees has been far from welcoming, protecting, promoting and integrating. For the first time in decades, an Australian government is actively challenging the multicultural consensus that has dominated the public and policy discourse on migration since the 1980s. In the international sphere, Minister Dutton's recent threat to pull out of the Global Compact for Migration is the clearest indicator of the government's current approach to migration. Domestically, a new bill making it more difficult for migrants to become citizens is once again on the table. Moreover, specific migrant and refugee communities continue to be damagingly singled out for spikes in crime as has been the case with the poisonous rhetoric on the South Sudanese community in Victoria. Many recognised refugees arriving by boat do not receive permanent protection visas. They have to restate their claims every three to five years, living in a situation of limbo and separated from their families, as if memories of persecution in chronically fragile states such as Afghanistan and Myanmar dissipate after these time periods. There is ample evidence to show that temporary protection visas do not deter future arrivals, but in fact worsen long-term settlement outcomes. "What we are likely to see is a manufactured humanitarian crisis of unprecedented scale in our main cities." More than 1500 people seeking asylum languish on Manus Island and Nauru, including 170 families and at least 158 children, as of February 2018. Although small numbers of people have been resettled in the United States, Australia has consistently rebuffed other options to end the crisis, such as New Zealand's offer to resettle 150 refugees. This is a policy that both the Australian Catholic Migrant and Refugee Office and Jesuit Refugee Service Australia have recently condemned in no uncertain terms. Extremely concerning is that the Australian government is also pushing ahead with plans to cut Status Resolution Support Service (SRSS), which is life-saving income support, specialist casework, and torture and trauma counselling services for up to 7000 children, women, and men seeking safety in the community who are waiting for their protection claims to be decided. In many circumstances, such as in the case of SRSS cuts, this power is beyond review by parliament or the courts. Successive ministers have played with these rights with impunity under the pretense of deterrence and safe borders. Under the ALP's No Advantage policy, most people in this group of 7000 were prevented from working, studying or putting forward their claims for protection. Then in 2015, the LNP reintroduced work rights, and a minority of people seeking asylum found jobs. Now by being cut off all support services and expected to find safe and sustainable employment in a matter of weeks, these women and men are being thrown into the mix of Australia's increasingly tight job market under the economic and moral fiction they can and should compete with the rest of the labour force. The inequities of years of limbo put the lie to this calculus. Like everyone else, people seeking asylum want to work. Although some may find temporary and casual jobs, others, like many Australians, will struggle to secure jobs. Many women and men likely to lose support are grappling with situations of increased vulnerability such as post traumatic stress disorder, histories of torture and trauma, lack of local experience, and language barriers, which will prevent them from working. Implementing SRSS cuts to its full conclusion will cause families to become homeless, destitute, hungry and exposed to situations of harm. What we are likely to see is a manufactured humanitarian crisis of unprecedented scale in our main cities. This is the political climate we must confront and take stock of during Migrant and Refugee Week. Let us continue to heed Pope Francis' call that 'we may all learn to love the other, the stranger, as ourselves [and] foster a culture of encounter in every way possible'. We can do this despite the current political climate, and also let our representatives know how we feel and why. Carolina Gottardo and Nishadh Rego are Director and Policy and Advocacy Coordinator respectively for Jesuit Refugee Service Australia. The current Government might decide who comes to this country and the circumstances in which they come. But the voters will decide who wins the next Federal election! Please vote for compassionate politicians who want to end the cruelty that continues to be metered out to innocent asylum seekers sent to Manus Island and Nauru. These people must be brought here to Australia as quickly as possible before any more of them die or suffer life-long trauma from their years of being held in these off-shore hell-holes! Now here's an idea. Perhaps Sydney Anglican hierarchy could chip in a million dollars for a media onslaught by the Australian Christian Lobby and the Catholic bishops could send letters home with every school kid to say that this is as important an issue as was marriage equality. I wonder if Grant Allen decides who comes into his home, and the circumstances under which they come. Grant Allen writes, "Please vote for compassionate politicians who want to end the cruelty that continues to be metered out to innocent asylum seekers sent to Manus Island and Nauru." I wish I could. Many people who argue for bringing prisoners from indefinite detention in Manus Island and Nauru to Australia seem to forget that this is a bi-partisan policy and practice, started by Kevin Rudd and the then ALP government, and maintained by the Abbott / Turnbull LNP Coalition government. Both sides of our Federal Parliament are committed to indefinite detention of innocent people who mistakenly believed Australia would live up to its claims of believing in, and practicing "a fair go". Even if we can find, and vote for, compassionate MPs on the back bench of either side, or among some cross bench senators, nothing will change. The numbers are simply not there. Argument by analogy is always problematic Joe, but since you started it: What would you do if a frantic child fleeing an abusive adult knocked on your from door? Would you put the child in the chook house? Of course government, or more precisely parliament, will always decide 'who comes and in what circumstances'. That's a truism, not an argument. It's the criteria which are currently being used to make those decisions that are being challenged. We don't own this country, anymore than mankind owns the earth. We are at best its trustees, with a responsibility to conserve it and use it for the benefit of all creation. Some additional things to consider, perhaps to add to the list. In the last year, the 900,000th refugee to be resettled since 1947 arrived in Australia. Australia does not host or allow the UN to run camps in remote areas. It has made them citizens. It's un Australian to deny people the opportunity of citizenship. And the second. Despite the various attempts to poke Australians in the eye on this issue - claims of racism, cruelty etc - new research shows that 81% of refugees found it easy to make friends in Australia. theconversation.com/refugees-are-integrating-just-fine-in-regional-australia-101188makes The research also shows high levels of success with refugees in education, feelings of safety. acceptance etc. One thing we need to ponder - the artifice of government policy [one of these aspects of policy being offshore detention] and the private reality of a community. How important is that welcome to refugee arrivals? How do we build that community of support around them? In fact, as this research reveals, we already have built it. You will be hard pressed to read anything, or acknowledges this aspect, in the recent history of writing and debate on the issue of refugees and asylum seekers. It's important that, when 2000 or so have been imprisoned in offshore camps, we understand that over 100,000 arrived. We can't lose sight of that; we need to be concerned for their welfare. My response, when I read of cruelty, is to increase my support to them. Ginger,in the circumstances you mention, of course I would let the child in and deny entry to the abusive adult who is chasing the child. I decide that the child comes in and the adult does not. The decision is made by me, and not by somebody else, especially not by a people smuggling crook in another country. You're right, Ian, the numbers are not there... yet. But they could be, and it doesn't need a majority. The electorate has already denied both major parties a majority in the Senate. It could do the same in the Reps if a dozen or so electorates returned right-thinking independents or minor party representatives who could then make reform of our refugee policy part of the price of occupying the treasury benches. That's obviously going to be more difficult to achieve in single member lower house seats than in the Senate with its proportional representation, but it's not impossible. His words are very nice but what is the Catholic Church doing in the way of helping migrants in terms of setting up hostels, providing legal help, medical help or other on the ground support? Joe, that's an argument that you might use to justify turning the boats back but it is irrelevant to the question of bringing to Australia those who are on Nauru and Manus and who have been deemed to be genuine refugees. Here is a seriously disturbing article from Fairfax Europe correspondent Nick Miller that any serious discussion of refugee issues needs to acknowledge. www.theage.com.au/world/europe/i-m-not-a-racist-but-immigration-a-key-concern-in-swedish-elections-20180822-p4zz16.html It documents the impact on Sweden of its liberal migration policies. It is heading rapidly to the right - commentators talk about "the failure of the social compact." Of crime, riots, murders and civil strife and one of the factors seems to be the assimilation, or lack of assimilation, by the children of earlier migrant arrivals. This is not alarmist, partisan writing; its Nick Miller, Fairfax's Europe reporter, a steady, brilliant journalist. This is why two things are critical for those who seriously wish to see a humane resettlement policy in the future. The impact and education around resettlement issues. How well refugees are assimilating; flourishing. It needs to be front of mind. Its boring stuff like training programs and education and targetted support and how communities can respond. This is why the Toowoomba research, on the success of Australian integration, is important. We need more of this - evidence and research and action. Secondly, advocates too often mock and ridicule widespread desire [and all countries face this] for some kinds of control. For filtering. The UNHCR role needs to be understood and respected and supported. All European countries that faced the mass migration of 2015 have now headed to the right. A feeling of being overwhelmed. It was a big negative. The future for Europe on this issue seems to be - unilateralism, detention, growing deportations, social strife, shut borders, secretive government, offshoring, stronger policing. John Kilner. The Toowoomba research on integration of refugees is a particularly flawed and meaningless piece of research and should not be taken as any sort of blue print for the successful resettlement of migrants or refugees. The numbers involved in Toowoomba are 23 Christians from Syria, 14 Yazidis from Iraq and 6 Muslims from Afghanistan. These people have not settled in a largely non-English speaking ghetto as happens in Sydney and Melbourne and have no choice but to assimilate in the Australian way of life. They have found assimilation easy, speak English well and are reportedly very happy with their new land. They are also equally distributed between men and women, are families with children in contrast to the mass Muslim migration of young Muslim men to Europe from North Africa since 2015. Of those reported in the Toowoomba research greater numbers settled in Brisbane and Logan, all of them Syrian Christians who arrived under the Turnbull plan and, again, didn't settle in an established ghetto. The total number of subjects in the full study was 155 adults and 59 children, too few to draw any meaningful conclusions other than those that apply to the subjects of the study themselves and certainly not sufficient to establish a universal policy for the rest of the country. Jillian Curr, I refer you to "What have the Romans ever done for us?" (Life of Brian) Fortunately, the answer would take much longer than 20,000 words. I apologise that Catholics haven't spent a lot of money telling you! And I apologise that I personally haven't been involved in a re-settlement scheme or working as a Catholic migrant chaplain in Australia for some years now; only raising money.